Cora E. Nickersin married David Monroe Houghton, son of Harrington Houghton and Alda Candance Antrim Modlin, in circa 1908 mar 2 y in 1910 census. Joyce Ann Rowland married Daniel Donald Johnson in Apr 27, 1963 at Houston, TX, USA. Sabina (?) married Herbert F. Young in circa 1907 mar 3 y in 1910 census. Norma D. (?) married Franklin Seth Houghton, son of Edwin Washburn Houghton and Elmira E. Barrus, in circa 1902 mar 8 y in 1910 census. 1910 Census 1910 Detroit, Wayne Co., MI, USA, age 26, automobile cost acct. Edna Lucille (?) married Harry Woolford Houghton, son of Judson Edward Houghton and Cora B. Rogers, in circa 1907 mar 3 y in 1910 census. 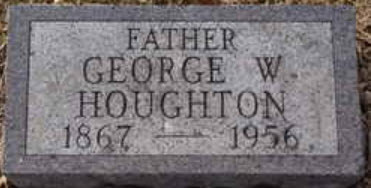 Charles Houghton married Mary (?) in circa 1917 each age 24. Mary Irle married Amasa A. Houghton, son of Rev. Dr. Amasa Hendrick Houghton M. D. and Eunice Barrows, in circa 1879 mar 21 years in 1900 census. Clara Gale Campbell married Frank Leslie Houghton, son of William Henry Houghton and Agnes Park, in circa 1904 mar 6 y in 1910 census. Emma J. Orr married John Saxton Houghton, son of Joab Houghton and Mary Jane Frigitt, in circa 1904 mar 6 y in 1910 census. Don Leroy Houghton married Mary Ellen Danham in Jan 3, 1931 at Plattsburg, MO, USA. George W. Houghton married Anna Belle Ramsey in circa 1890 mar 20 y in 1910 census. Sarah (?) married Earl D. Houghton, son of William Houghton and Minnie Racy. Florence M. Houghton married Richard Beck in circa 1906 his 1st, her 2nd; mar 3 years in 1910 census. Richard Beck married Florence M. Houghton, daughter of Harvey Albert Houghton and May C. Flannary, in circa 1906 his 1st, her 2nd; mar 3 years in 1910 census. Ada (?) married Harvey Albert Houghton, son of Joseph Houghton and Levina J. (? ), in circa 1900 mar 0 y in 1900 census. (?) Houghton married Cornelia King. Verda Sur Stevens married Roy Finis Houghton, son of Mary E. Houghton, in circa 1912 age 28 and 21 in 1930 census.